Now that you know how Textpattern articles and sections work, let’s see how to create a dynamic website with Textpattern, by using a couple of very simple examples. The intention is to concentrate on showing how the Textpattern tags fit together, so we will deliberately omit much of the HTML that you would use in a proper website. We’ll assume for the sake of simplicity that the doctype and head meta data, like the navigation menu and the footer, will be the same on every page. In practice, of course, the HTML title at least will be unique to each page. We’ll deal with this minor complication later. Then we add the Textpattern tags that allow the template to function. There are two ways to do this. Both achieve exactly the same effect. Incidentally, the standard Textpattern page field is quite narrow, so it may be a good idea to create the code for the page using a text editor, then paste it into the page. You can use these conditional statements any number of times on each Textpattern page. Choose whatever arrangement makes the code easiest for you to follow. and a linked list of all the articles in that section. Of course, the choice of HTML tags is up to you. 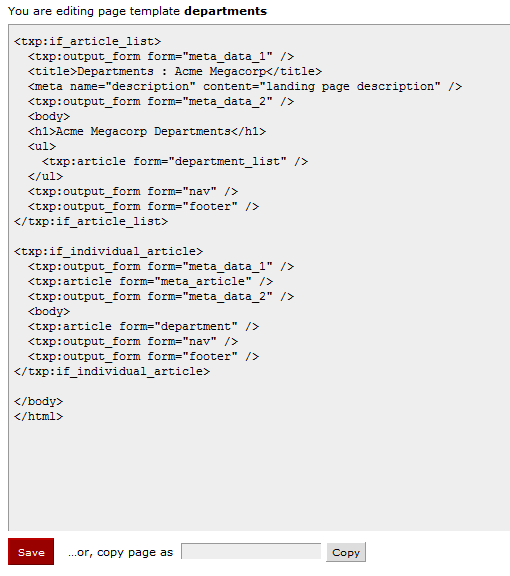 This means: take all the articles from this section and insert them at this place in this page. This means: insert only the most recent article. This means: insert only those parts of the article that are specified in the form called latest. The default behaviour of a Textpattern landing page is to display a complete list of articles, starting with the most recent. Whenever you create a new article, it will be automatically added to this list. Place this code inside an article form called, say, ‘list’. See the Textpattern website for a full list of Textpattern tags. In practice, of course, you will probably want to add more HTML mark–up to these bare bones. But this is all you need to make a landing page work. the body of the article, which will normally incorporate a number of HTML tags. Place this code inside an article form called, say, ‘whatever’. You can of course include more than this if you like. To return to an earlier example, let’s suppose that the section in question deals with the various departments within a company. The landing page lists all the departments, and each department has its own HTML page, which displays specific pieces of information about each department: a contact name, a phone number, and a fax number (well, some companies may still use them). These three pieces of information may be included in the body of the article. If, however, they are to be displayed separately from the rest of the body text, it may make more sense to place the information in custom fields. Go to Admin then Preferences, and give appropriate names to the custom fields. Place this code inside an article form called, say, ‘department’. In practice, as with the earlier example, you will no doubt want to include more HTML code than this. and as many article forms as are necessary to display the various elements of the articles, depending on the context. In the above examples, we assumed that the doctype and meta data would be the same on every page, so we moved it all into one miscellaneous form for convenience. In practice, some of the meta data will change from page to page. This can be automated by using conditional statements. Areas 1 and 3, which will be the same for every HTML page, can be moved into two miscellaneous forms. The title and meta description of the individual article page, on the other hand, will contain information specific to each article, and can be dealt with by using conditional statements and an article form. The meta title can be taken from the Textpattern page title. The meta description can be taken from whichever spare article field you care to set aside for it. Usually a custom field would be suitable, so create one called ‘meta_description’. Both methods will produce exactly the same result. And there we have it: everything you need to create a fully–functioning database website! There is one final ingredient in the Textpattern recipe: categories. We’ll deal with them next. Continue with the next article: Textpattern : Categories.